TITAN TITAN HERCULES 2 50 AMP CONTROLLER ETL LISTED (702770) SEEDS ETC. 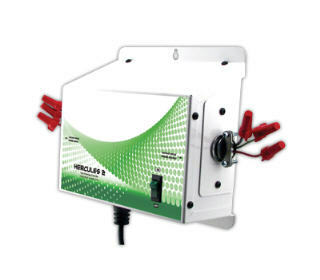 The Hercules 2™ is a ‘trigger’ operated, high amperage controller. This device allows you to operate up to 50 Amps of lights, heating or air conditioning by wiring 120 or 240 Volt power through the ‘Power Input’ and connecting your lights, heater or A/C to the ‘Power Output’. The appliances can then be activated by a trigger cord set via an environmental controller, timer or other such device. This product incorporates a Siemens heavy duty contactor relay! Featuring a 50 Amp Siemens contactor relay. Durable 20 gauge powder coated chassis. Use with Titan Controls environmental controllers and timers! Can be wired for 120 or 240 Volt applications. 50 Amps/120 or 240 Volt/60 Hz.